Yes, Saint Patrick’s day is coming up. And yes, this is the time of year when it’s all corned beef all the time. Let me tell you a secret. I was a bartender in college; it ruined March 17th forever. I do remain a corned beef fan, however. I had never even thought to make my own corned beef before Charcutepalooza but once I realized how EASY it is, I never turned back. Perhaps you’ve purchased the pre-brined corned beef in the store? Just stop that right now. I’m telling you that homemade is going to be from better meat, it’s going to take the same amount of work, and it will cost less and taste a million times better. Pink salt in the brine is entirely your decision. I like a nice pink corned beef, so I use this minimal amount. If it bothers you, leave it out. The corned beef will not be pink, but it will taste the same. Your pickling spice is important, so use a store-bought one you love or stir one up yourself. Simmer the meat with lots of pickling spice for many many many hours. No kidding. Put a plate on top to keep it submerged. 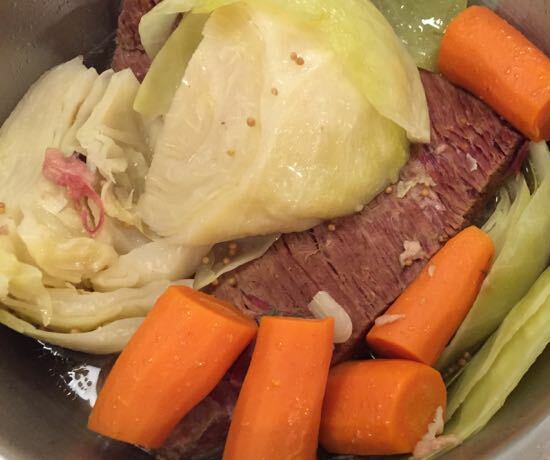 The corned beef in these photos cooked for 4 hours before it even began to be tender. Promise me one thing? Never let it boil. Boiling the meat will make it tough. A gentle simmer is all you want. 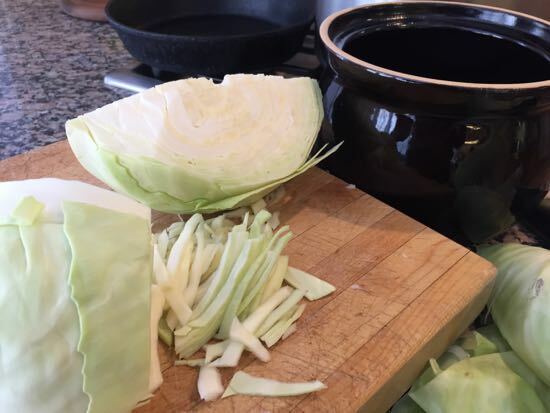 Add cabbage and carrots for the last 30 to 45 minutes of simmering (just when the meat begins to feel tender – about three hours into the cooking process. Wait. You have sauerkraut, right? Have a lovely week, my friends. In an 8 to 12 quart non-reactive (stainless steel or enamel over cast iron pan) stock pot, add the water, salt, brown sugar and pickling spice. Bring to a boil until the salt and sugar completely dissolve. If using, add the pink salt and stir well. Cool thoroughly. Trim the jiggly fat from the brisket, leaving the firm white fat. 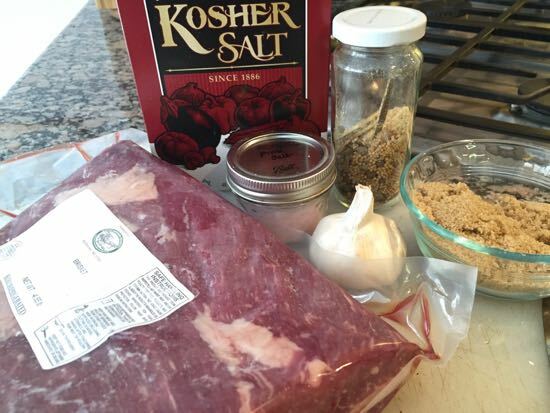 Slip the brisket into the completely cooled brine. Cover and refrigerate for five days. Remove the meat from the brine and rinse well. Discard the brine and rinse out the pot. Return the meat to the pot and cover with cool water. Bring to a simmer for 30 minutes. Remove the meat and discard the water. Return the meat to the pot, cover with cool water, add the remaining pickling spice and return the pot to the stove. Bring the water to a simmer, do not boil, and simmer for three hours. Check for tenderness. It should just begin to feel fork tender. Add the cabbage and carrots and continue to simmer for 30 minutes, check the meat to see if it is completely tender. Continue cooking for up to one additional hour. If, after four hours, it does not seem tender, remove the meat from the simmering water and place on a cutting board. Test again. Continue cooking, testing every 15 minutes, until tender. It is possible to overcook the meat, resulting in dry corned beef. If this happens, steam the meat before serving. 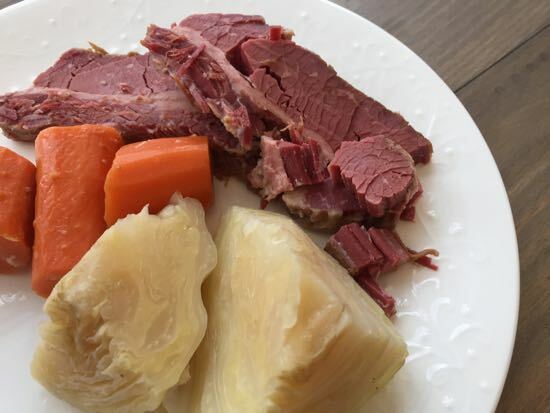 Remove the corned beef from the liquid, and either serve warm, sliced against the grain, with the cabbage and carrots, or chill well, then slice thin or thick – your choice – and make sandwiches. On rye. With homemade sauerkraut. And spicy mustard. Of course. And all those edges and leftover bits? That’s your hash. With onions and potatoes. You’re welcome. I miss Charcutepalooza too. I made my corned beef with tongue, tricked my family into eating corned beef (tongue) hash which they loved and they’re still mad at me to this day! They found out when they read my blog, lol.